Water is of course essential to life, and it is therefore unsurprising that in Greek mythology there were water deities. What is perhaps surprising though, is the sheer number of water gods and goddesses there were. Every river, lake, fountain and spring had a minor deity associated with it, whilst the open expanses of the sea had major and minor gods and goddesses. Below are just six of the more important sea gods of Greek mythology. Pontus was one of Hesiod’s Protogenoi, a first born god of the cosmos, Pontus being born from Gaia (Earth) with no father. Pontus though, could be regarded as the father of all sea life, for from him all subsequent sea gods derived. By partnering with Gaia, Pontus’ offspring would include; Nereus (see below), Thaumas (god of sea wonders), Phorcys (see below), Ceto (goddess of large sea creatures) and Eurybia (goddess of the mastery of the sea). Pontus tended to be primarily associated with the Mediterranean Sea. Nereus was the original Old Man of the Sea, and the sea deity most closely associated with the bountiful supply of fish. This sea god had the ability to change shape at will, but this did not stop Heracles catching hold of Nereus, when the hero required information from the god. Nereus was the eldest son of Pontus and Gaia, and with his wife, the Oceanid Doris, would become parent to the Nereids, the sea nymphs. Nereus would be closely associated with the Aegean Sea, with the deity thought to live in a palace beneath its surface. Phorcys was another son of Pontus and Gaia, and was the sea god normally associated with the dangers of the open water. Phorcys was married to the sea goddess Ceto, the goddess associated with the large creatures of the sea. Phorcys and Ceto would become parents to famous figures in Greek mythology, including Scylla, the Gorgons, the Graeae and Ladon. Oceanus was a Titan, one of the sons of Ouranos and Gaia, although he is perhaps not strictly speaking a sea god, despite being associated with what we might today consider by the Atlantic Ocean. For in antiquity, Oceanus was thought of as a river that encircled the whole earth, the river existing beyond the Mediterranean and the Straits of Gibraltar. With his consort Tethys, Oceanus would become father to the 3000 Oceanids, nymphs of fresh water, and the 3000 Potamoi, the gods of the rivers. As such Oceanus was thought of in terms of being the source for all of the world’s fresh water. Today, Poseidon is the most famous of the sea gods of the Greek pantheon, and with the emergence of the Olympian gods, would supplant those that had gone before. In Greek mythology, Poseidon was given dominion over the earth’s waters following the Titanomachy, although to a certain extent Poseidon was primarily associated with the Mediterranean, with Oceanus still thought of in terms of the unknown water beyond. 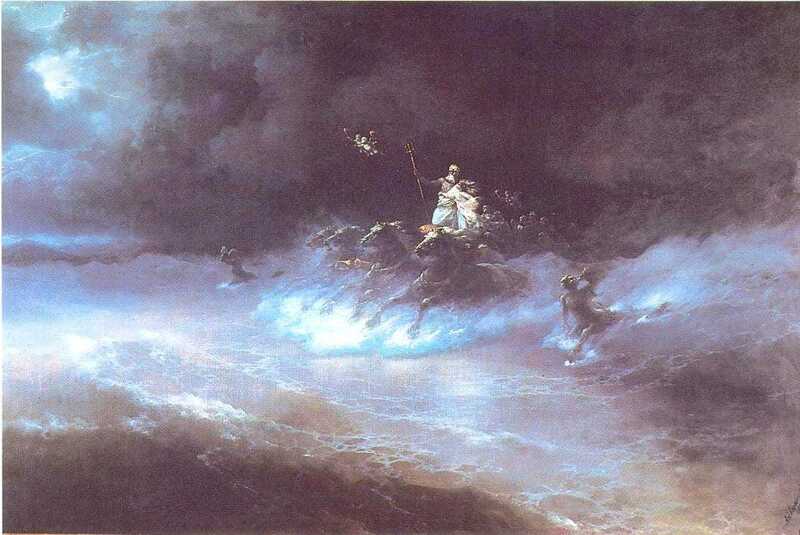 Poseidon was also linked with horses and earthquakes. Poseidon appears in more mythological stories than any other sea god, and is of course noted for his role in Homer’s Odyssey. Triton was the son of Poseidon and Amphitrite, and acted as the messenger for his father. The early depictions of Triton were that of a fish-tailed man, and so it is this sea god who is closely linked with mermen. Triton would possess a trident, but the sea god also owned a conch shell (Sea snail shell), which when blew through, would arouse violent seas, or calm them.